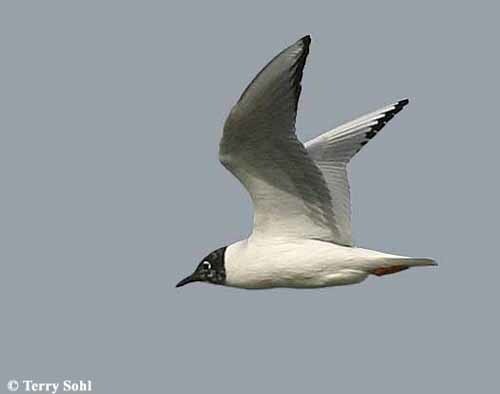 The Bonaparte's Gull is the smallest gull found in the South Dakota. They are different than many other gulls in that they rarely visit garbage dumps. They are also unusual in that they nests in trees instead of on the ground. Bonaparte's Gulls are named after a distant cousin of Napoleon. Habitat: Usually near rivers and lakes during migration through the state. During the summer breeding season, they are found along lakeshores and riversides bordered by coniferous forest. Diet: Insects, fish, crustaceans, but mostly insects on migration through the state. Behavior: Forages while in flight, by dipping to the surface to pick up items or sometimes plunge-diving. They also can "fly-catch, snatching insects during flight, and will also pick up food items while wading or swimming. Breeding: Non-breeder in South Dakota. In breeding range, the nest of a Bonaparte's Gull is a platform of sticks, lined with softer vegetative material such as grasses or moss, placed in a conifer tree, or sometimes on the ground. The female usually lays 3 eggs, and both parents help to incubate them. When the eggs hatch, both parents help to feed the young. Song: Low harsh grrrrrr or reeeep. Migration: More common in the east than in the west during migration. 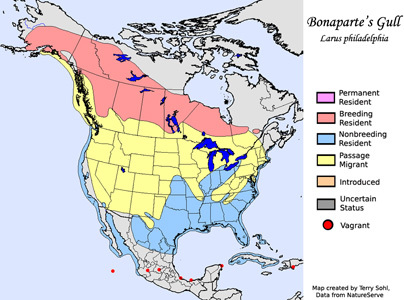 Summers in Canada and Alaska, winters along U.S. coasts and southward. Similar Species: Franklin's Gull, Laughing Gull, Sabine's Gull. See Identification Tips. They are also similar to the Black-headed Gull, a species seen with increasing regularity in North America. Conservation Status: Populations appear to be stable or increasing. The IUCN lists the Bonaparte's Gull as a species of "Least Concern". Additional Photos: Click on the image chips or text links below for additional, higher-resolution Bonaparte's Gull photos. South Dakota Status: Common migrant in the eastern part of the state, rare migrant in the west.